There’s a good chance you’re already aware that your new phone loses value as soon as you take it out of the box. Wear and tear, frequent new releases and tech leaping forward at lightning speed means that what you carry in your pocket can end up out-of-date fast these days. But did you know your phone might be haemorrhaging value even faster than your car? Typically, in the U.S, a car loses between 15 – 20% as soon as it’s driven off the lot. Comparing that figure to phone depreciation, it seems like tech items are much faster at losing their value than those big ticket items. What exactly is cell phone depreciation and why does it happen? 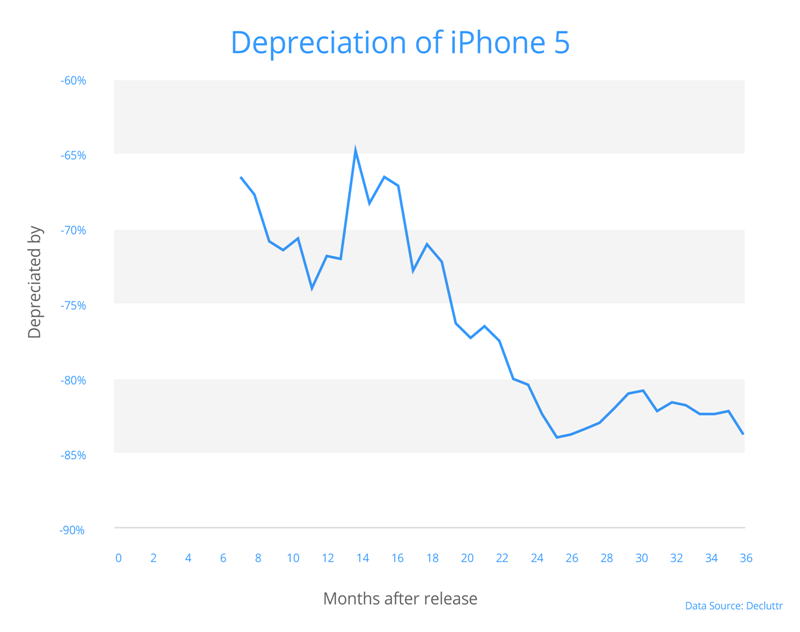 Depreciation refers to an object’s loss of value over time. It happens to pretty much everything we own, but technology and cars are especially prone to it. This is because we all go in search for the new and the best as new features and models emerge, meaning that the older stuff gets left in the dust and loses its financial worth. 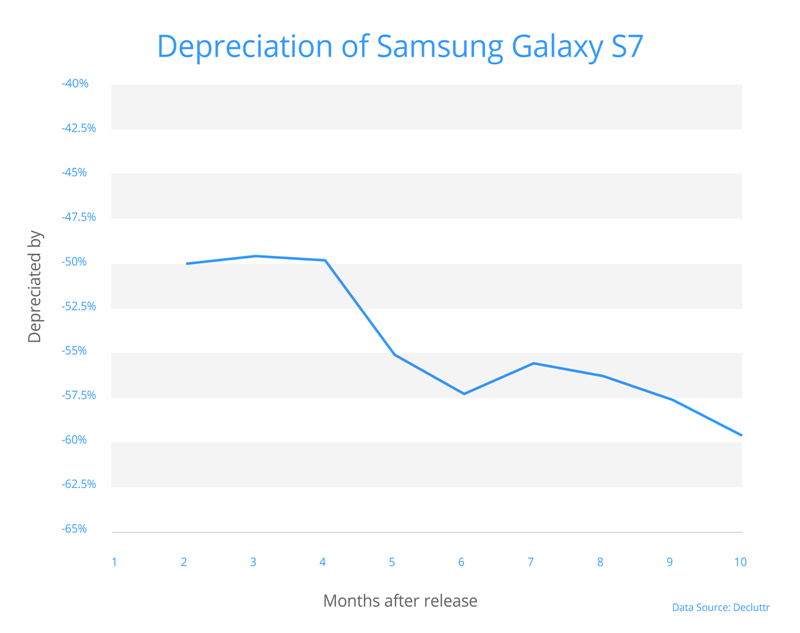 So which cell phone brand depreciates quickest? 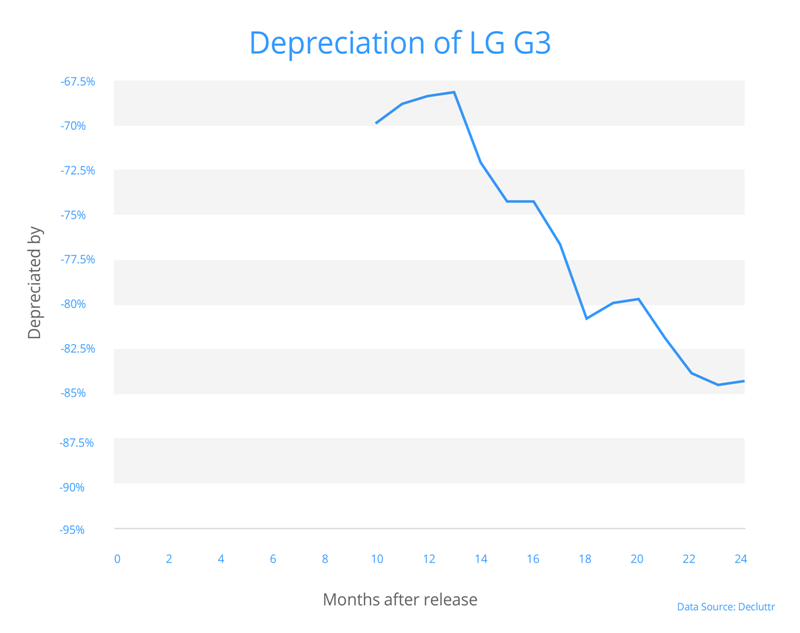 After 12 Months: The worst performer a year in was LG, with its models shedding just under three-quarters of their value by this point. Samsung and HTC phones did slightly better, with both losing 72% of their value. Apple came out on top, with their phones losing a respectable 57%. That might still sound like a lot, but they’re the clear winners. After 24 Months: It’s LG and HTC at the bottom, losing 84% and 85% of their value on average respectively. That’s significantly more than the 65% an Alfa Romeo Mito loses. Samsung did a touch better, but they still fell well behind Apple’s iPhone models. 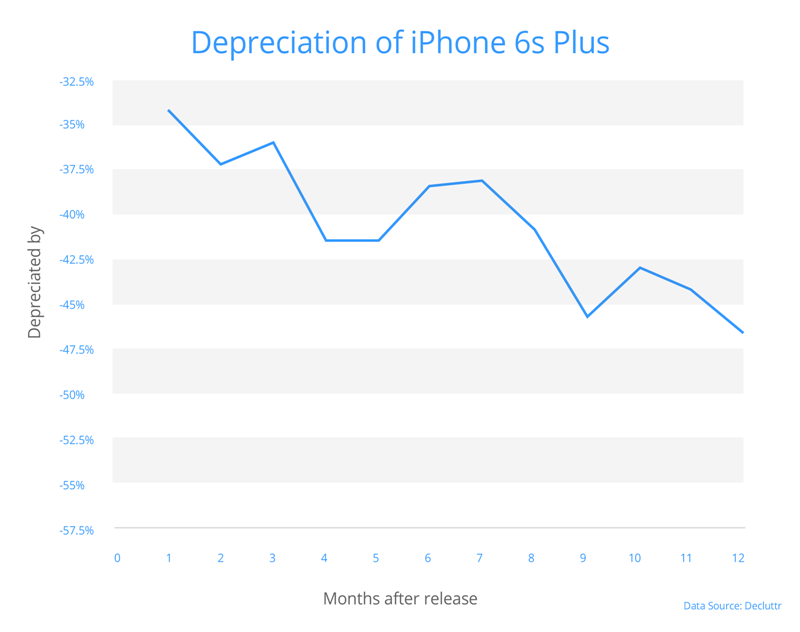 How quickly does your phone depreciate? Click the manufacturer of your device to find out! 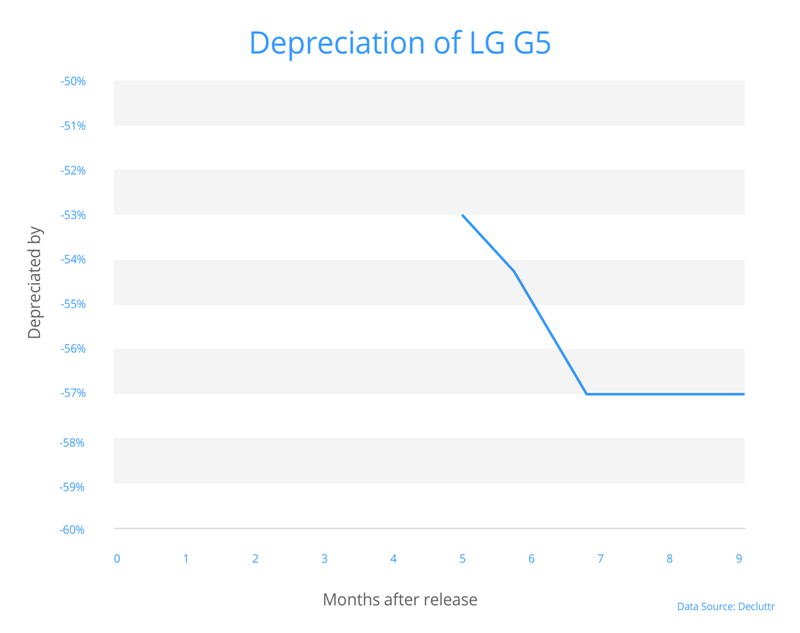 If you’re an LG Phone owner, you may be shocked to discover just how fast these phones depreciate. On average they fare only a touch better than HTC phones, but lost more value than Samsung and any iPhone model. The LG G3 was a notable example. It all started out okay, with it retaining a third of its value at the 12-month mark… but from there on it plummeted, ending up worth barely a sixth of its original price after two years. 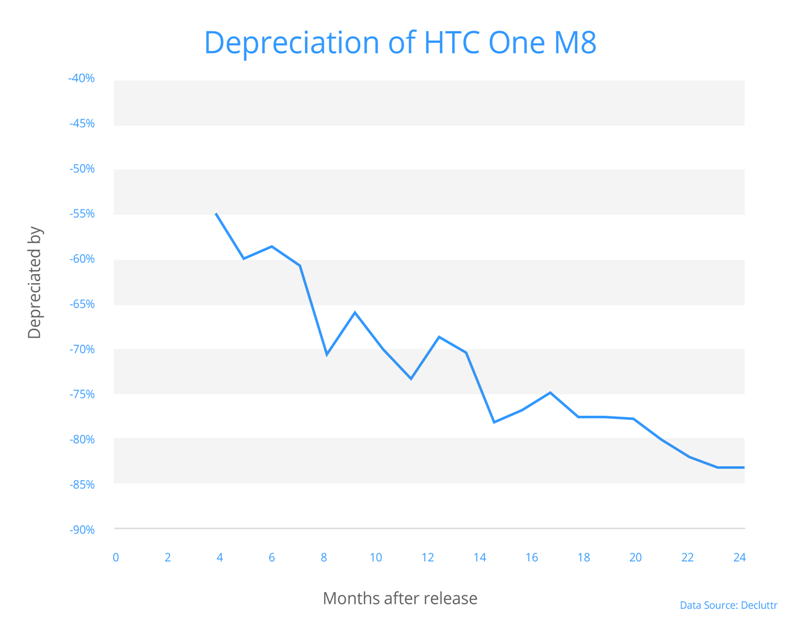 Interestingly, it’s depreciated at almost the same rate to the HTC One M8, which was released at a similar time. 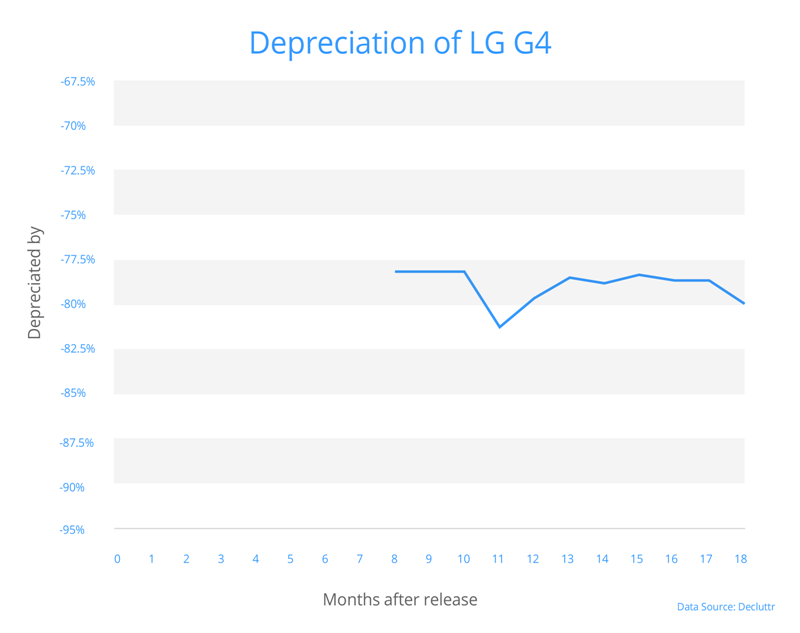 The G4 fared worse. 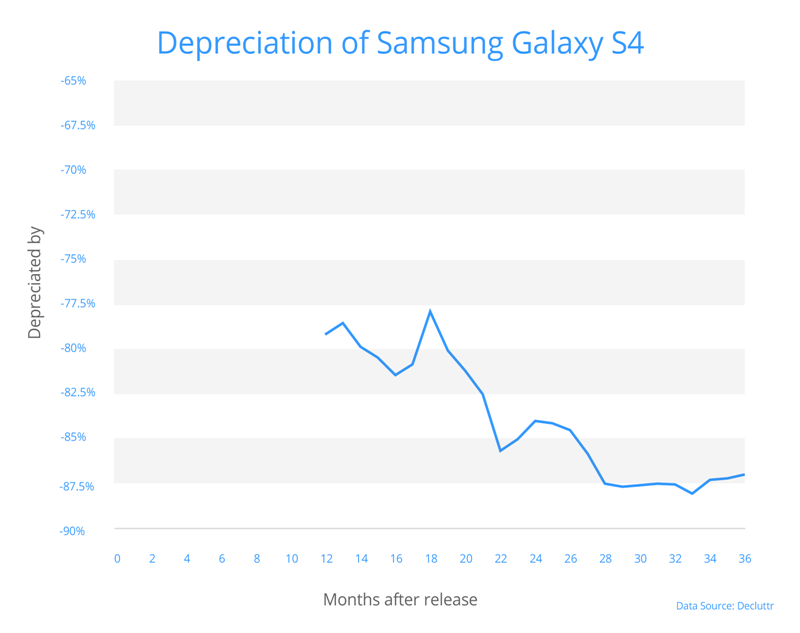 Not only did it lose a massive chunk of its value almost the minute it was released, but it was the worst depreciator of any phone we studied at the 12-month mark. It had lost an enormous 78% of its value at this point, more than a brand new Fiat 500L loses in the same time period. A fairly new entry to the market, this phone was released in April 2016. Nine months later, it had lost 57% of its original value. That being said, that’s well below the average for an LG phone, so it’s holding up well by comparison. Bad news HTC owners – these phones are notorious value shedders from the minute they leave the box. 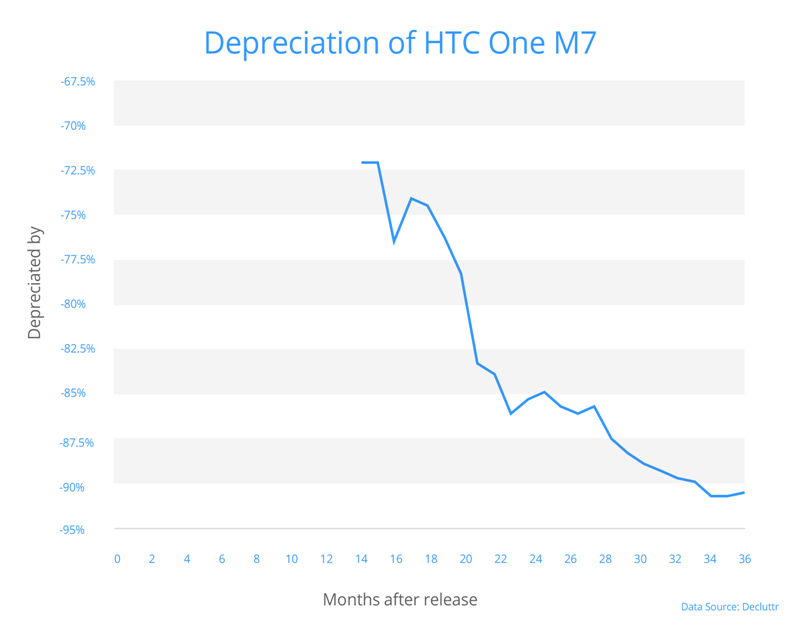 Two years in, the HTC one M7 was the biggest depreciator of any of the phones we studied. It had lost a shocking 86% of its purchase price; that’s significantly more than the 66% of value an Opel Meriva shed in the same time. 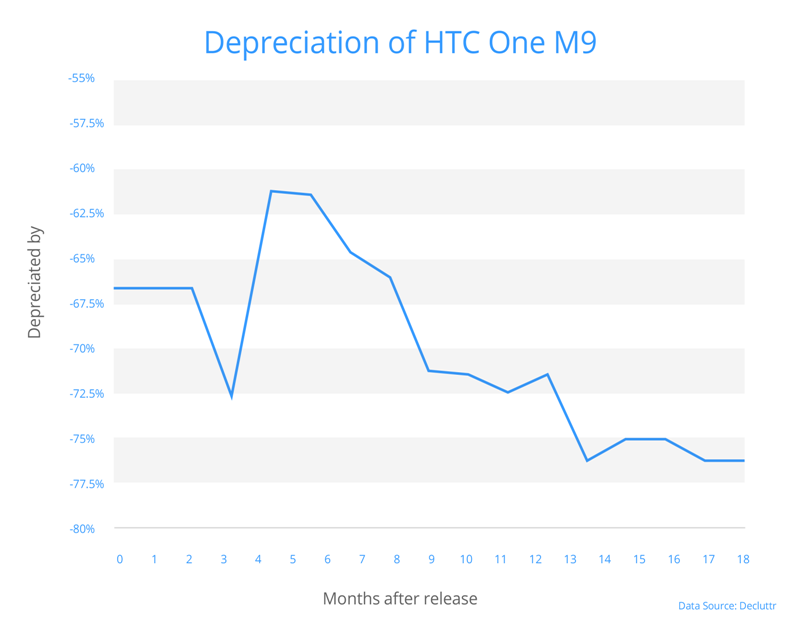 The HTC One M8 was one of the worst devices when it came to losing value quickly, shedding a hefty 65% in just a few weeks. It lost a further 10% across the first year to end up just a quarter of its original worth after 12 months. Ouch. This phone showed an odd trend; it bounced back from an initial dip seen in the first six months. After that, as ever, it was steadily downhill. Now that almost two years have passed since its release the M9’s lost 78% of its value, only a touch better than its predecessors. 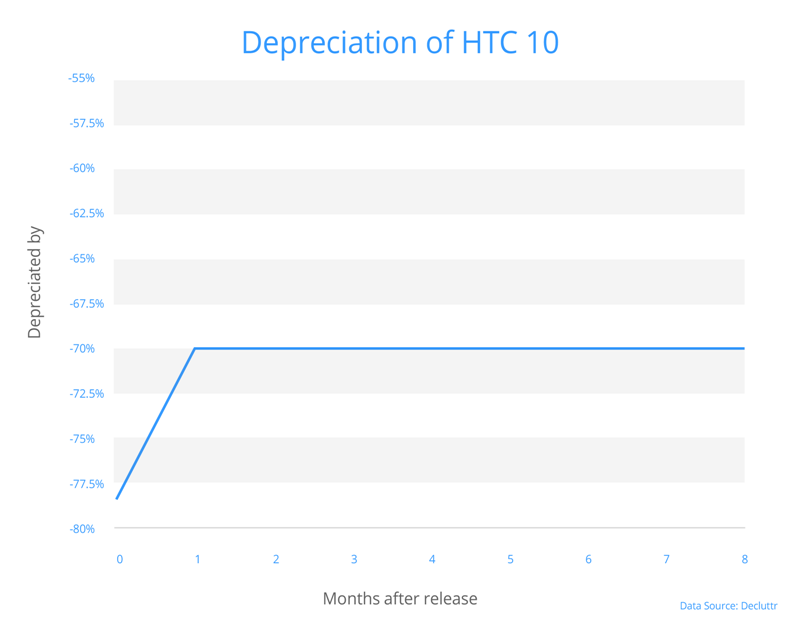 The newest of the HTC models we looked at, the HTC 10’s depreciation looks to be a real warning sign. Just six months in it lost 70% of its value; that’s a larger loss than any of its HTC predecessors at this stage. If you’re a Samsung phone owner, you may think you’ve got one of the most hi-tech, innovative cell phones on the market. It won’t lose too much value, right? Wrong. While Samsung models did slightly better than LG and HTC phones, they fell behind their iPhone rivals by an average of 12% each month. It’s hard to believe five years have passed since Samsung gave us the S3. This phone’s value trended steadily but heavily downwards, ending up worth 19% of its purchase price 24 months in. 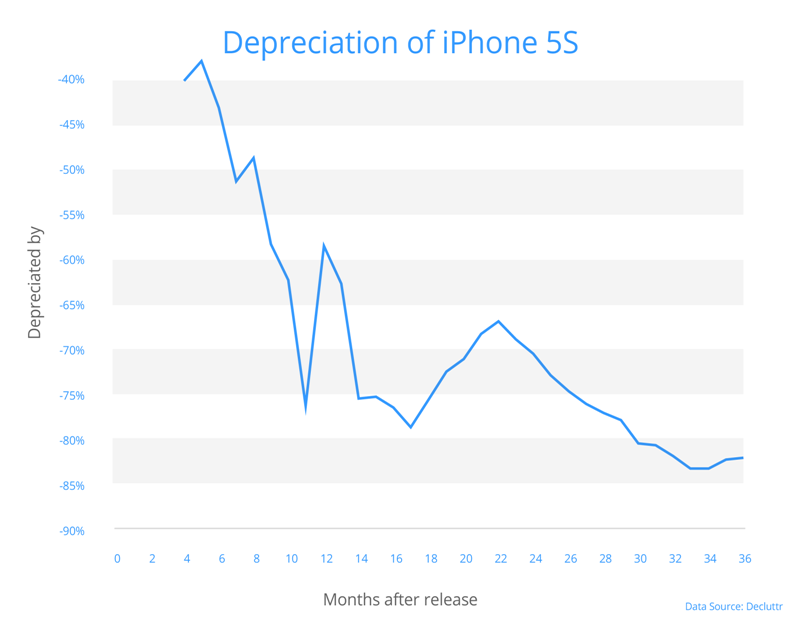 That dramatic spike in depreciation? That’s the month the iPhone 5s was released. 12 months in, the S4 had said bye to a huge 78% of its worth, just a touch better than HTC and LG rivals such as the One M8 and the G4. While depreciation slowed significantly after this, it still dropped in value further to lose 83% overall. Surprisingly, that’s over 8% worse in the devaluation stakes than the worst offending car we studied, the MG6. 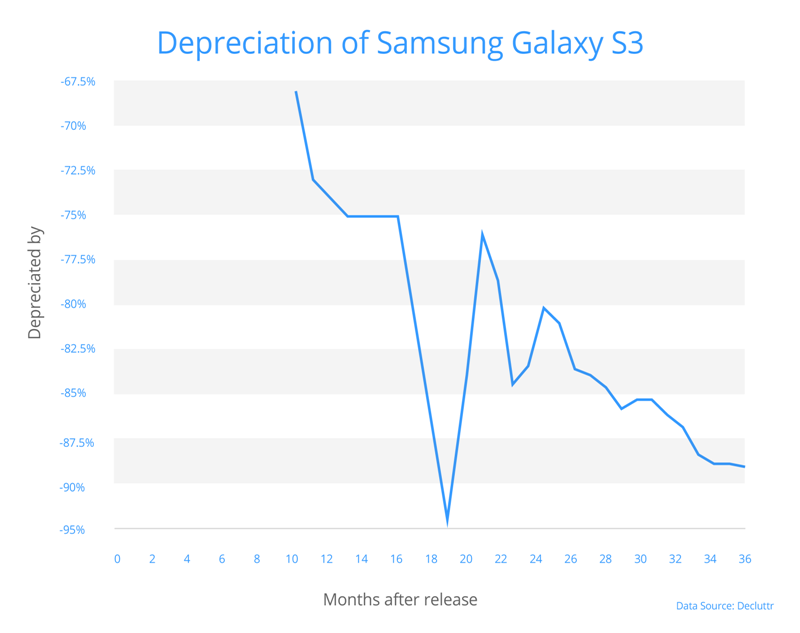 The S5 begun its depreciation with a bang by losing half its value in month one. 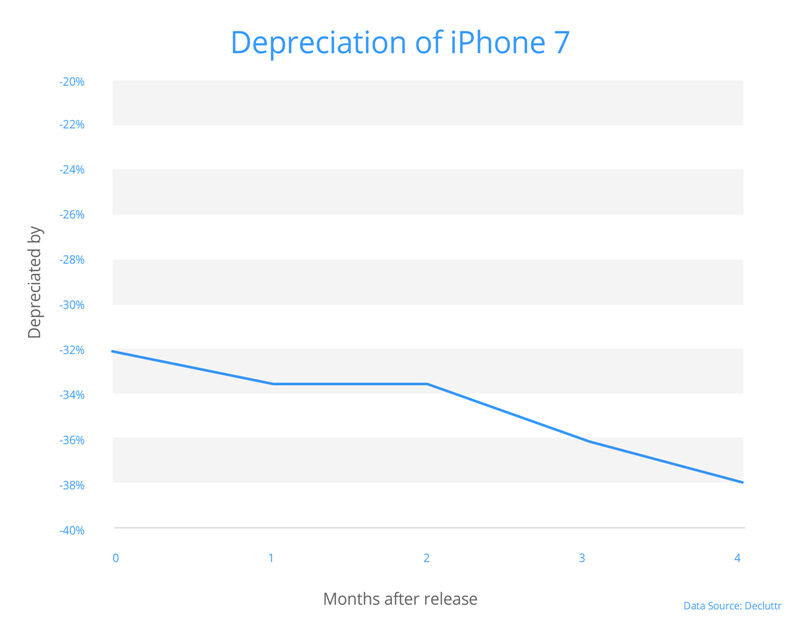 It held steady until the iPhone 6 came along in month seven, causing it to drop to just 27% of its original value. Two years into release it was worth 21% of its starting price; that’s slightly better than its predecessors. 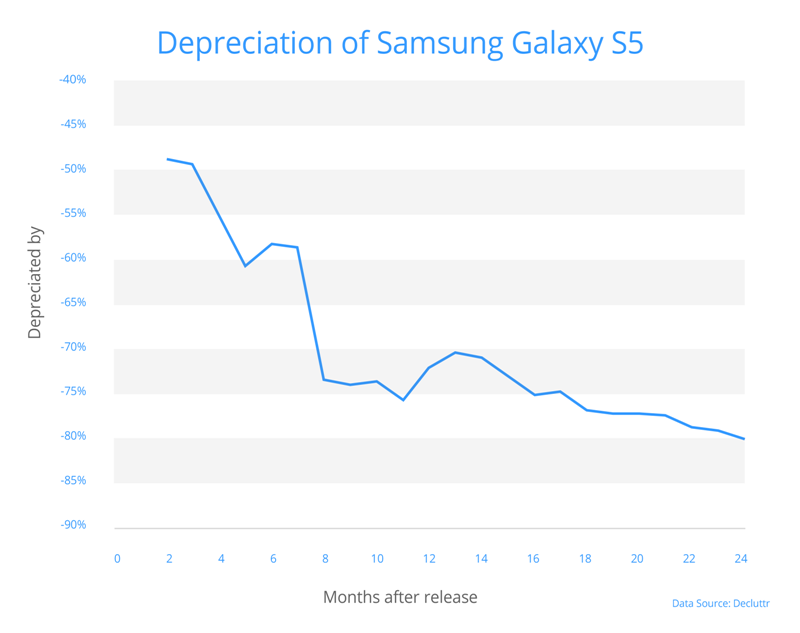 Like its predecessor, the S6 saw a sharp drop in value upon release. It also took a similar hit as a new iPhone model came along to compete, and this instantly dragged its value down to 40% of where it started. Almost two years since release, it’s worth 30% of its initial value, which is a significant improvement on previous Samsung models and compares well with rival brands. The youngest of the Samsung phones we looked at, the signs are good for the S7. After ten months this phone kept 41% of its value. That might not sound great, but it beats any LG, HTC or previous Samsung phone. iPhones, however, were a different story altogether. 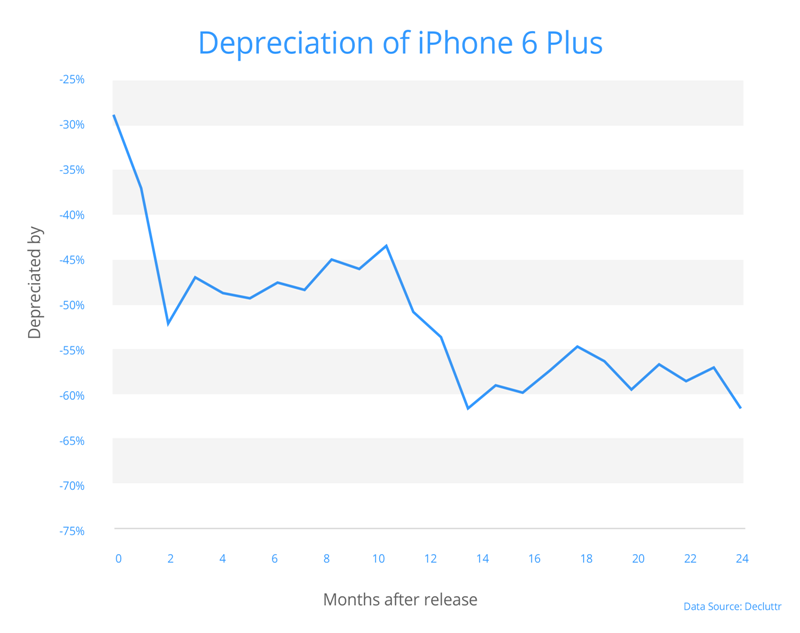 Across the board, across all timeframes and models, iPhones always came out on top for retaining value. From the first month when other models shed extraordinary numbers right through to the two-year mark, Apple’s phones performed best. A year in, the iPhone 5 had shed a whopping 74% of its worth, falling well behind HTC and LG rivals. It did eventually make up for this as over the following year it only lost 3% of its value. 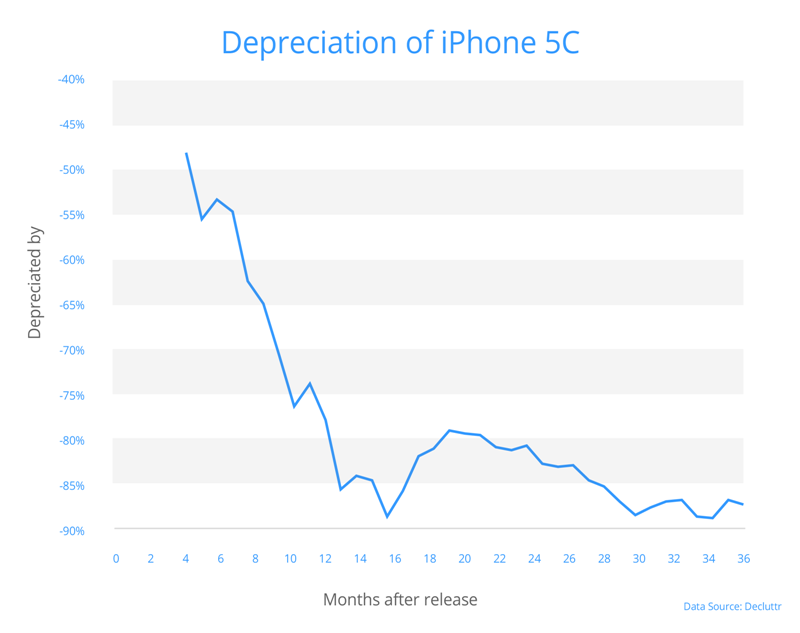 Unlike other iPhones, the 5c saw a steep and extreme drop in its worth early on. This left it valued at only 27% of its starting price 12 months in. Thankfully the loss slowed and after two years it was worth a fifth of where it started. It’s this phone that marks the beginning of Apple’s good fortune when it comes to resisting depreciation. 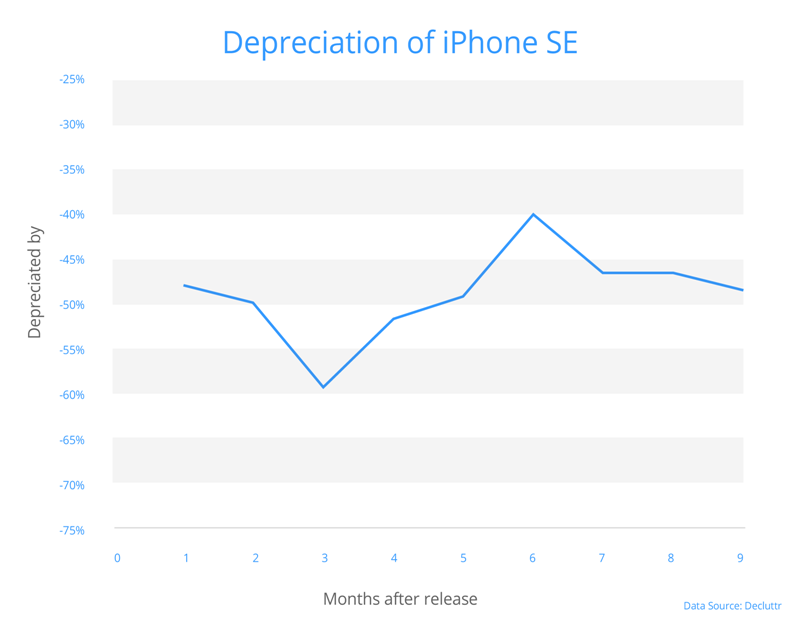 There were big loses and sharp drops along the way, but the 5s always seemed to bounce back, worth 41% of its original value after 12 months and 29% after 24 months. Two years down the line the 6 had lost only 66% of its original value. For comparison, that’s a whole 20% less than the HTC One M7 lost in the same time, and roughly the same level of depreciation as a Maserati Quattroporte. But best of all was the iPhone 6 Plus. It retained 38% of its initial sale price even 24 months on. That’s actually less depreciation than any car we studied, bettering the 36% an Infiniti Q50 clung on to. A year since it emerged on the market, the 6s is clinging to its value well by comparison. It has only shed 47% of its worth after a year, pulling a touch ahead of its 6 and 6 Plus predecessors so far. 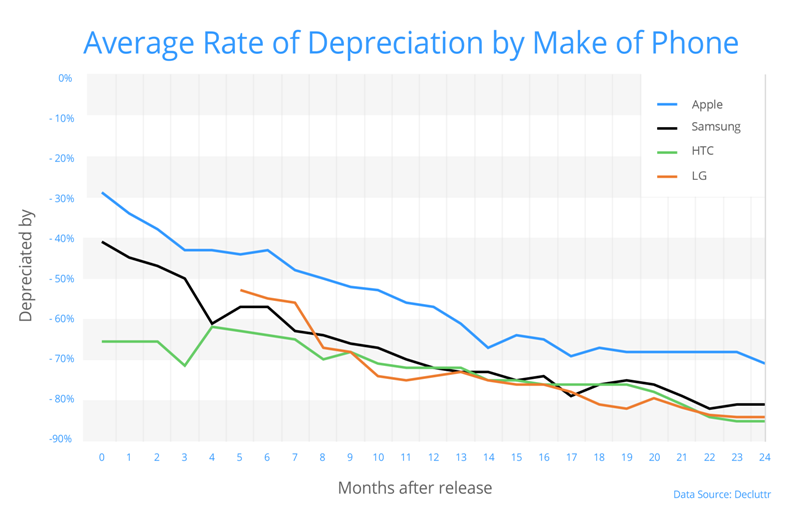 The bigger sibling of the 6s did better still, managing to retain 54% of its original value 12 months into release. And the 7 looks set to go one better. At the four-month mark it was still worth 62% of its starting price, setting it up to retain value rather nicely. It’s not all great news though. The fairly new SE model just isn’t keeping up. 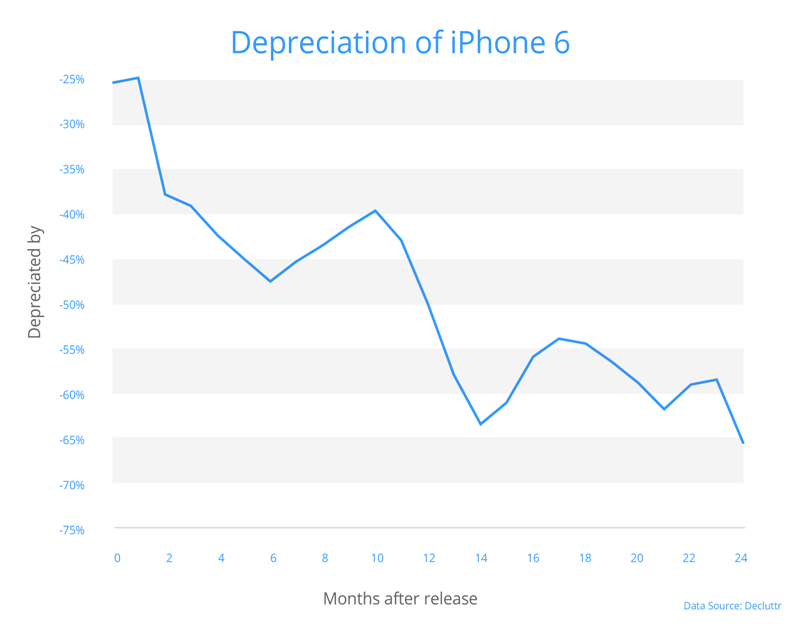 With depreciation of 52% in the first ten months, it’s the worst performing iPhone since the 5c. So are newer or older models better at keeping their value? It seems that the newest models of LG and HTC phones are shedding their value faster and faster, while the reverse is true of Apple and Samsung, who have seen a slowdown in depreciation with their latest releases. This suggests the industry is becoming less competitive – where these latter two are beginning to take control of the market and are winning out. A new iPhone release always seems to have a big impact in the industry, too. 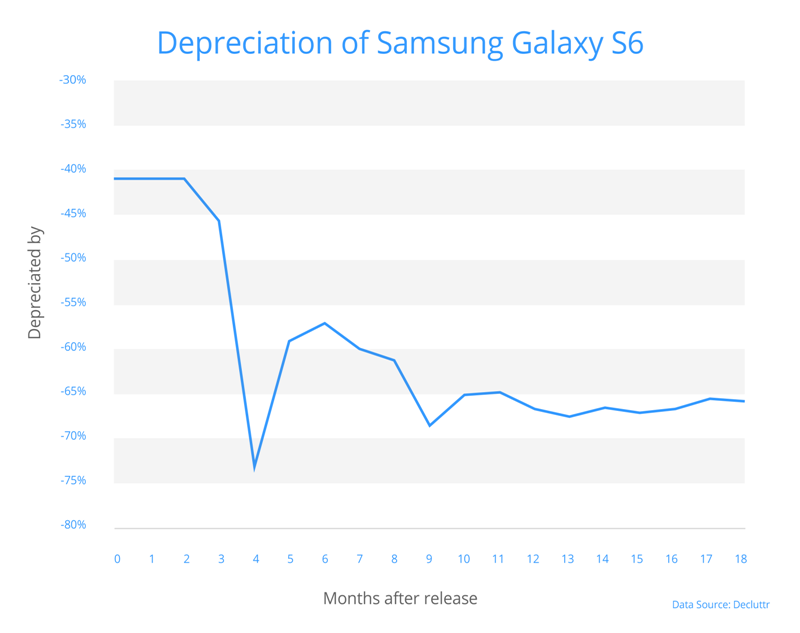 When the Galaxy S5 suddenly had the iPhone 6 and 6 Plus to contend with a few months into its release, its value plummeted 15% in the weeks that followed. This phenomenon wasn’t restricted to other brands’ cell phones though. 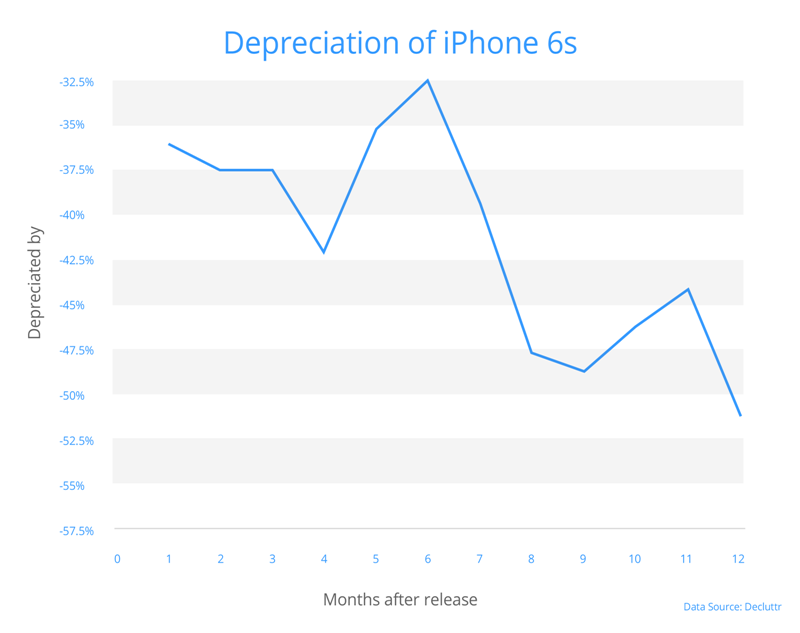 As anticipation grew for the iPhone 6, the value of the 5 model went into a tailspin, losing 14% of its value in each of the months running up to the release of the 6. The market’s tough, and it seems only the strongest make it! If you think it’s probably time to say goodbye to your cell phone before it loses its re-sale value, see what you could get when you sell your phone today. 8 of the best spin-offs EVER!